Starting with a flight into Biratnagar we trek for 3 days upto a 10,000ft pass above the sacred lake. With the most magnificent views of Everest and Kanchenjunga, we descend into the lush valley arriving at Dobhan to start our amazing river expedition. 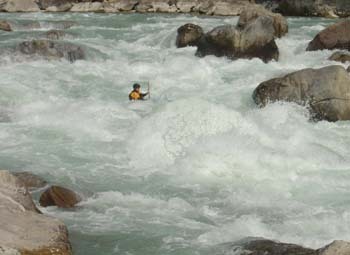 The first rapids are powerful and continuous, hemmed in by steep canyon walls. In the middle section the river opens up and there are beautiful white sandy beaches. The last few days where the river turns back to the west is phenomenal. Towering waves leap skyward, with seemingly endless rapids. After breakfast we head to the airport for a 55 minute flight to Biratnagar, taking in the amazing Himalayan views along the way. Transfer from Biratnagar to Basantapur for over night camp. The final day we raft the Sun Kosi to Chatara. Flight back to Kathmandu. Price includes: Airport pick-up and drop off, all accommodation, all meals, guides, all transport during trip, internal flights, permits, national park fees (where applicable).